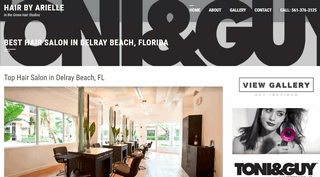 There’s a lot of salons in Delray, but around here one thing is for sure; it’s hard to find a good hairstylist! Arielle Settel has been perfecting her craft for 19 years and counting. Having trained under Tony & Guy Acadamey of London and Vidal Sasson Stylist/Owner, John Peters, Arielle’s cuts are the definition of perfection. With an extensive background in both cutting and styling hair, Arielle can help you achieve the look you want. Bring in a magazine article with a haircut you like, or pull up a few images on your phone, and let Arielle work her magic.